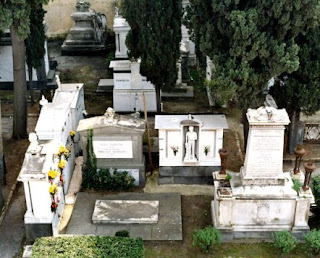 The Poggioreale cemeterial complex experienced a gradual development since the second half of the XVIII century and now covers approximately fifty hectares of the hill by the same name. The component that marks the beginning of the graveyard infrastructural pattern at Poggioreale is the Cimitero di Santa Maria del Popolo, also known as "of the 366 graves", designed by Ferdinando Fuga, and built in 1762. The monument is of extraordinary relevance, as the only known example of cemeterial "Enlightenment building". 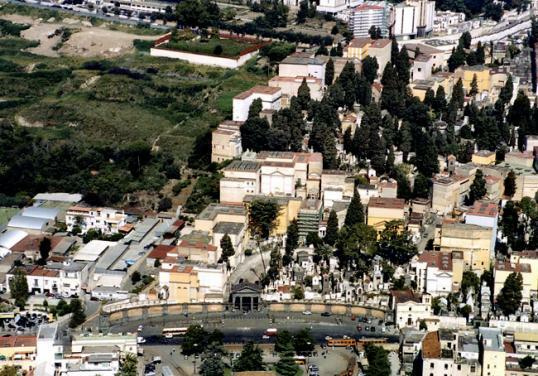 Another basic element of the cemeterial complex is the Santa Maria del Pianto graveyard, with the church by the same name, a XVII century central-plan building, around which, as early as the plague of 1656, corpses were interred. The Cimitero monumentale is the largest (162,873 sqm), most effective and most imposing plot.It opened in 1838, after several interruptions and some rethinking. The original plan (1825) was designed by Francesco Maresca; after his death, Luigi Malesci, Bridge-and-Road engineer, and Ciro Cuciniello, architect for the Royal House, took over. Oglejte si Historical Cemeteries of Poggioreale, Napoli, Italy na večjem zemljevidu.